08:45 a.m. - 5:00 p.m.
Zerto Virtual Replication (ZVR) 5.0 is the only future-proof, all-in-one replication and recovery solution that makes enterprise-class disaster recovery simple and scalable. ZVR 5.0 utilizes hypervisor-based replication of VM block-level changes, from any storage to any storage, to enable seamless protection of both VMware vSphere and Microsoft Hyper-V environments. With support for both on-premise and cloud-based recovery, ZVR 5.0 enables you to evolve your IT strategy and improve IT resilience by embracing hybrid cloud to day. Public Cloud is changing the way infrastructure and applications can be delivered, but how do you maximise the benefit without introducing just another management headache. Morpheus Data is a full feature cloud management platform that allows you do deploy into any public or private cloud infrastructure at either VM or Container level. As well single instance deployment, Morpheus supports applications stack deployment with application templating and integration into all major automation tools. Once deployed, instances can be monitored, logged and backed up. During the session we will show provisioning of a simple two tier app stack and then deployment of an application onto that stack. We will then look at how we can monitor and control that app through its life cycle. Adrian Hornsby – AWS Evangelist - Top 5 AWS Services that you will want to integrate with the VMware Cloud on AWS! Cloud native apps- Kubernetes . The What, Why and How – Nick Kenny - When supporting new applications that require the kubernetes framework there are various choices. This session will explain the various options and considerations from an infrastructure perspective. Operationalizing NSX – Atif Qadeer & Seema Shad - Get converged visibility across overlay and underlay, virtual and physical, private and public cloud. Integration with virtual (NSX) and physical layers (physical switches, routers, firewalls) connect the dots across vendors and cloud leading to plan micro segmentation. In this session, we offer “Site Recovery as a Service” with vRealize Automation, and show how Puppet can also be used with vRA to reduce configuration drift. This is a technical deep-dive with a hands-on demo… hold tight! 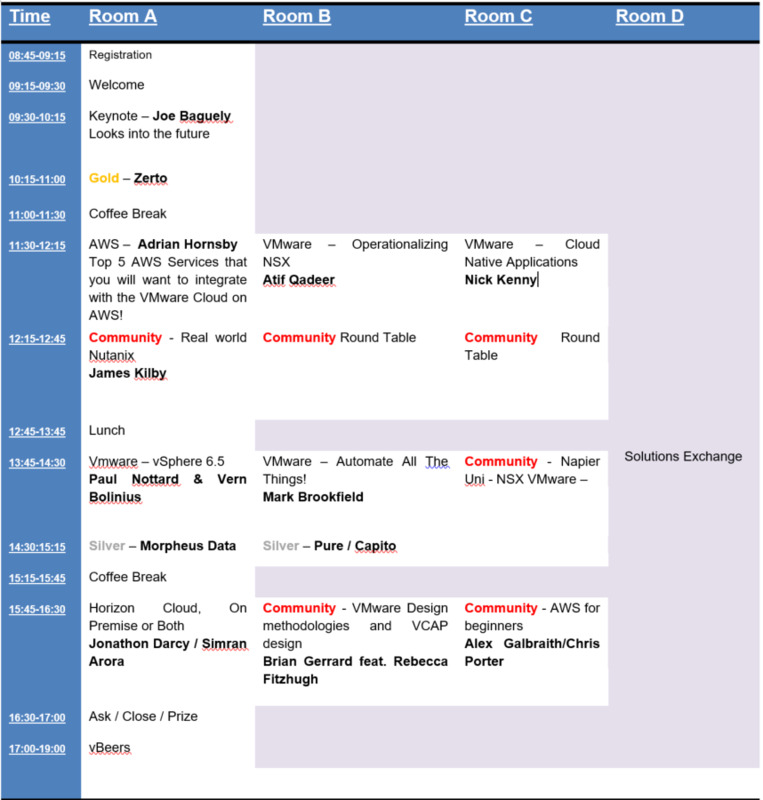 Next VMUG – Edinburgh, November. Please contact memberservices@vmug.com when you have any questions about registration.